This section of shore is less than 1km south of Stairhaven and Crow's Nest. The view here is north west towards Crow's Nest while Stairhaven is right of picture in a small bay out of shot behind the cliff face. Centre of picture on the horizon across Luce Bay is Challoch Hill NX1656 : Challoch Hill. This grid square only has about 50 yards of shoreline the rest being Luce Bay. In order to bag this first geograph my initial intention was to walk along the shoreline from Stairhaven which proved impossible even at low tide when I visited. The route I took instead was along the coastal path which runs across the cliff tops from Stairhaven to Auchenmalg and then climbed down the cliffs into the grid. 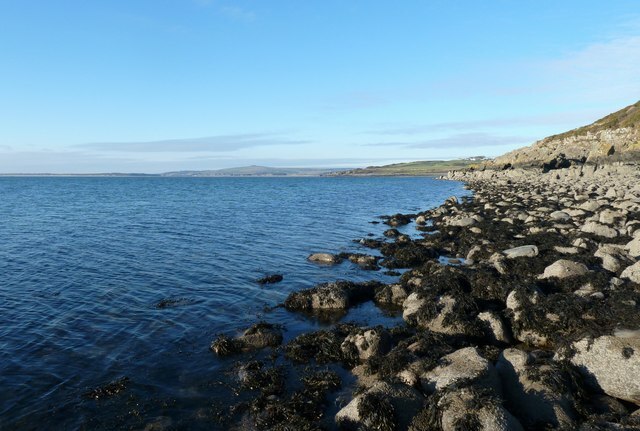 The part of the shore that I could walk on was very rocky and slippy and a tough challenge to get into and out of. Views however on the clear day I was there were great, the Mull of Galloway across Luce Bay was clearly visible. © Copyright Andy Farrington and licensed for reuse under this Creative Commons Licence.